Songs and more featuring American Sign Language, ASL . American Sign Language is the 4th most common language in the U.S. and if offers parents, teachers, and early childhood professionals with a wonderful way to provide language skills, increase vocabulary, support early learning, and enhance adult / child activities. Clear demonstrations and instruction of ASL signs in each video. 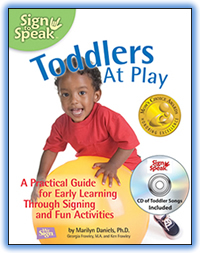 Most of the DVDs include a We Sign Instructor Track which feature an instructor clearly demonstrating each of the signs used in songs or for use with babies and toddlers. We Sign Baby Songs, Play Time, and Fun Time feature simple songs for babies through preschool and the signs are clearly demonstrated in each song. No experience with American Sign Language is needed to be successful with signing our activities with children of all ages. We provide you with everything you need to know but always sign at your own pace and ability. Though we show you all the signs you can use, start with the number of signs you are comfortable with signing and are reasonable for the age level of your children. We Sign DVDs are now available with CDs included. Most of the CDs offer songs at 2 tempos - at recorded tempo and at a slower learning tempo. Fun Time / Play Time and Baby Songs are the exception to this. We Sign's goal is to teach parents, teachers, and early childhood professionals how to incorporate playful signing activities into the lives of all children, enhance learning, and to create an awareness for a 2nd language - American Sign Language, ASL. Many of the DVDs include a We Sign Kids Track. This lets kids watch other kids sing and sign the songs. 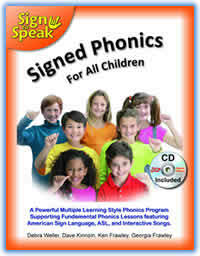 We Sign ASL sign language DVDs are designed for various ages and purposes. Babies & Toddlers 2 with Baby Songs DVD the Baby Songs CD features clear ASL instruction for baby and toddler signs. 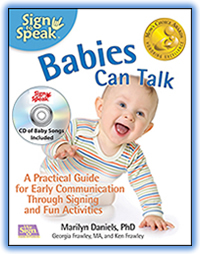 Included are the top 30 signs used with babies and toddlers, a 200+ word video dictionary, a Baby Songs DVD with demonstrations of 12 baby songs, and a Baby Songs CD for singing and signing – anywhere! 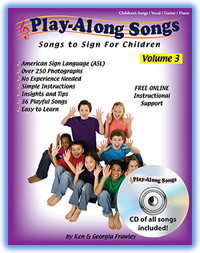 This is a 2 DVD collection of our best preschool songs to Sign with ASL. Over 23 songs will encourage language growth, develop fine motor skills, teach core concepts and provide for hours of fun sing and sign along interaction. This Award Winning DVD /CD set features ABC songs (at two tempos on the CD)) to sing and sign with children for the learning of the alphabet, first letter sound, and basic spelling. NOW INCLUDED Animals of the Alphabet. This DVD/CD Set features new and traditional non-religious Christmas songs (at two tempos on the CD) that can be performed with ASL and is ideal for adults and children alike. Learn to sign each song from our instructor. This DVD/CD Set features traditional religious Christmas Carols (at two tempos on the CD) that can be performed with ASL and is ideal for adults and children alike. Learn to sign each song from our instructor. This DVD/CD Set features American Patriotic songs (at two tempos on the CD) that can be performed with ASL and is ideal for adults and children alike. Learn to sign each song from our instructor. Pledge of Allegiance is included. The Original We Sign DVD series with Spanish language tracks. These We Sign ASL DVDs feature sign language songs by theme based on core educational concepts that you children all learn. ABCs, Colors, Numbers, Rhymes, and Animals all teach these concepts in fun and challenging ways. They all have ASL instructor tracks to walk you through each song and sign step by step. These songs provide powerful ways for children to learn and remember while having fun. These We Sign ASL DVDs feature sign language songs by theme offer challenging and fun ASL songs for elementary children through adult. More Animals teaches hundreds of ASL signs in a fun way. Classroom Favorites offers year round elementary songs with sign language. Patriotic DVD features great American Patriotic Songs that you can learn to sign. Santa’s Favorite Christmas songs features non-religious holiday favorites to sing and sign. Christmas Carols offers traditional religious Christmas Carols that can be sung and signed at home, school, or church. All We Sign ASL DVD’s were designed to teach parents, teachers, early childhood professionals, and caregivers how to use sign language with all children of all ages. Our babies and toddler DVDs are specifically geared for this age group and are designed to enhance early communication while building vocabulary. Our toddlers, preschool and elementary ages DVDs will help to grow vocabulary, build language skills, enhance fine and gross motor skills and support the learning of core educational concepts. No signing experience is needed. The DVD’s include instruction or an instructor track to demonstrate the signs that are featured. Sign as many or as few of the signs featured as you want. We have provided detailed instruction and demonstration on the signs that will be used in any of our over 100 songs. You can choose to sign all of them or begin with a few and add more as your proficiency increases. Adapt songs for your age group. Children find signing to be fun and challenging. Keep in mind that the younger the child, the fewer signs you should choose to use. As children get older and their physical skills increase, you can add more signs. Learn to sing and sign the songs first. The learning experience is greatly increased when parents, teachers and caregivers, learn each song or activity first. Once learned, they then instruct and help children to master the signs and songs. Children greatly benefit from this adult interaction.